Valencia is Latin for “strength”, and strong defines this collection, masterfully crafted with quality materials and built to last. The Valencia Collection brings warmth and old-world charm into your home, creating the calming and beautiful allure of the Mediterranean. The Valencia Collection’s distinct style originates in the countries along the Mediterranean Sea. Named for one of the oldest and most charming cities in Spain, the region is known for its’ turquoise waters, vibrant countryside, Tuscan vineyards and sun-drenched living spaces. Drawing upon these influences, the Valencia Collection captures the enchanting scenery and romanticism of the Mediterranean with an array of luxurious home furnishings, emphasizing the warm colors and earthy textures found in the surrounding landscapes. Valencia is crafted of radiate hardwood solids with white oak, walnut, and pine veneers. Features include wrought iron décor with cast metal accents, top-grain leather and Jacquard fabric, all reminiscent of the Baroque style seen throughout the Mediterranean. 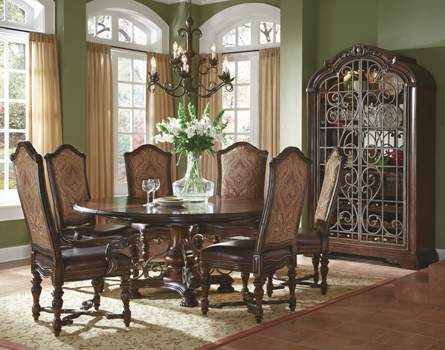 The multi-step, hand-distressed Port finish accentuates hand-laid veneer patters and intricate cravings. Cases are dressed with custom cast hardware in an antique brass, aged patina finish.